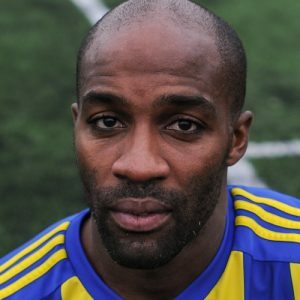 Sean Williams – first goal for Khalsa, and what a goal it was. Khalsa finished 2018 on a high, secured a measure of revenge for last week’s defeat at Quorn and prepared for the big FA Vase clash at Godmanchester with a useful 3-1 victory. Goals from Josh Thomas, Mensah Kinch and an absolute beauty from ex-Quorn man Sean Williams helped Khalsa to an important victory. But they were made to work hard and – as they did against AFC Wulfrunians on Boxing Day – come from behind. Stephen Hart, on course to break all sorts of league records this season, grabbed his 36thof the season in the tenth minute. Sam Arnold was on his toes to race out of his area to head a through ball but only as far as Hart who brilliantly launched a looping shot back over everybody and dropped it just underneath the crossbar. Khalsa went immediately on the hunt for the equaliser. Thomas, lively and dangerous all afternoon, lashed a shot across goal just minutes after his side fell behind and on 25 minutes linked up well with Williams but Hayden Whitcombe in the Quorn goal did well to block. The equaliser came on 29 minutes, Liam Armstrong feeding Kinch to score his first league goal of the season. Seconds later, Kinch turned provider, crossing for Thomas whose effort bounced back off the woodwork. And then, Thomas did make it could in the 31stminute, turning in a Kinch cross to put Ian Rowe’s men ahead. To cap an action packed five minutes, Thomas was then denied again by Whitcombe as he wriggled through the defence and the referee played an advantage as he was held back. The second half began with Quorn hitman Hart breaking through but uncharacteristically fluffing his opportunity and putting it wide. Seconds later at the other end, Thomas’s 20 yard effort was tipped over well by Whitcombe. Williams – in only his second appearance since joining from Quorn – then robbed Michael Townsend and made it 3-1 with a delightful chip on 51 minutes. Two more chances for Khalsa really ought to have put them out of sight, first Thomas crossed for Dan Westwood who did everything right with his header only for Whitcombe to save, and the keeper was again the saviour for Quorn, denying Thomas yet again after another mistake by Townsend. Quorn fired a warning shot when Sean Gedde’s effort smacked squarely off the woodwork and bounced to safety, suggesting there was still life in the visitors. But Khalsa were more likely to add to the scoreline as a fine probing cross from Armstrong on the left flank almost found the outstretched foot of Thomas and then in the final stages substitute Nick Turton’s header flashed just wide from Williams’ cross. Sporting Khalsa: Sam Arnold, Carlo Franco, Alex Woodhouse, Leon Miles, Tes Robinson (captain), Dave Meese, Mensah Kinch (Alex Perry), Liam Armstrong, Dan Westwood (Nick Turton), Sean Williams, Josh Thomas (Garfield Robinson). Subs not used: Remi Birch, Jay Holdcroft.